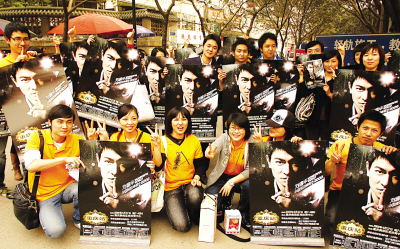 Tickets sales for 2009 Andy Lau Wonderful World China Concert tour Chongqing started yesterday as it once again prove the charisma of heavenly king Andy Lau. A long queue was formed early in the morning at Yangtze Island Hotel’s 26 storey ticket selling venue, the queue was so long that it stretch from inside the hotel till the road outside the hotel, the number of people queuing was amazing. From our understanding, a total of more than 1000,000 tickets were sold. As early as 7:00 am, fans started queuing outside the hotel main door, when the ticket sale started at 10:00 am, it was jam packed at the 26 storey ticket selling venue, thus fans had to wait at the first level of the hotel. Some onlookers exclaimed: “I thought what had happened, until I was told that these people were queuing up to buy Andy Lau’s concert tickets.” The hotel staff also express that the hotel was jam packed by Andy’s fans, they were everywhere, at the 26 storey, inside the lift, the hotel lobby, this create some inconvenience for the hotel guests. The organizer of the concert also expressed that this is the first time that they encounter such situation. With regards to the inconvenience caused for the hotel, both parties are current discussing for a solution as they hope that fans can buy tickets smoothly and hotel guests can get in and out of the hotel smoothly. Tickets are also sold at the concert venue, Datianwan Stadium which also has many going there to buy tickets. The person-in-charge of Andy World Club also asked its members to go there to show support for their idol. The members wore orange to show their support, hands holding the concert poster, some whom bought their tickets immediately asked to join the club as they filled up the application on the spot. From the ticket sales, the most popular tickets are still the $1880 and $188, till 2:00pm, more than 1000,000 tickets were sold.